The secret hidden in KFC's Twitter account - revealed! Twitter users have had a collective epiphany – and it’s a revelation about KFC’s account which is causing all the wonderment. 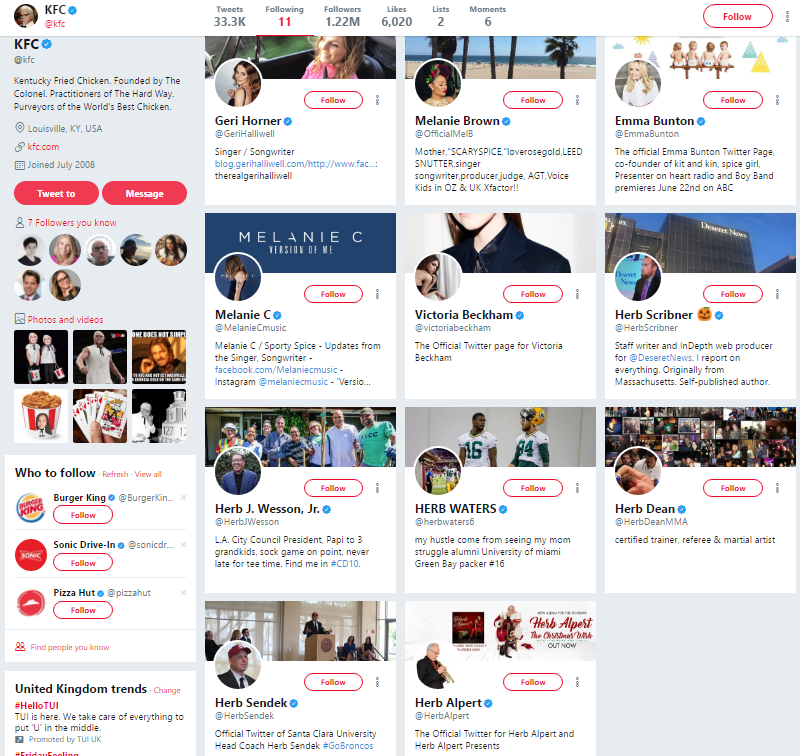 It turns out the fried chicken giant has been shrewd and deliberate in who it chooses to follow on the social media site. That’s right, the fast food chain follows all five of the Spice Girls and six blokes named Herb. That amounts to 11 herbs and spices – a reference, of course, to KFC’s top-secret fried chicken recipe. KFC founder Colonel Hardland Sanders’ formula has been closely guarded ever since he perfected it in 1940. Naturally the discovery that KFC has been paying homage to its famous collection of ingredients on Twitter has blown minds everywhere. Others suggested that whichever marketing genius came up with the idea needs a pay rise. One user who is an expert on branding even been offered the brilliant mind a job. Apparently that guy is chief brand officer for Ford Motor Company. Lots of free chicken or potentially a free car – it’s up to you KFC Twitter person, but it seems like an easy decision.